A decent apartment in Seoul has long been a symbol of middle-class success. Apartment ownership is also a measure by which social strata are divided. 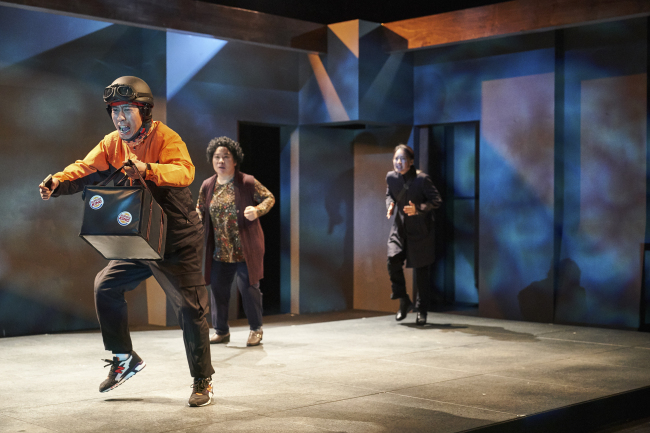 Based on Kim Yoon-young’s novel by the same title, “Tracking Down the Steel Container” is a drama that tackles the divide, as well as how people look at poverty -- and at people living in public housing in particular. The drama unfolds in Suseo-dong, Gangnam-gu, a wealthy district at the southern end of the capital with high-end private apartments as well as a public housing complex. Suseo-dong symbolizes the capitalist society, where an individual’s success is an achievement and failure is assumed to represent a mere lack of effort. “Tracking Down the Steel Container” also shows how the stereotype is passed down to the younger generation. At school, students from affluent families have inherited their elders’ view of wealth and poverty and scorn students from the public housing complex. Although they wear the same school uniform, the youngsters’ lives differ dramatically depending on the financial status of their families. “The fact that my parents can’t afford an iPad makes me a theft suspect,” says Lee, one of the main characters, who lives in a public housing complex. As the curtain rises, Ms. Bong, a middle-aged teacher at a local middle school, is running after a young delivery worker -- likely a graduate or dropout from the same middle school. Bong asks him if he knows the whereabouts of her student Lee Jung-hoon, who has been absent for two days with no explanation. 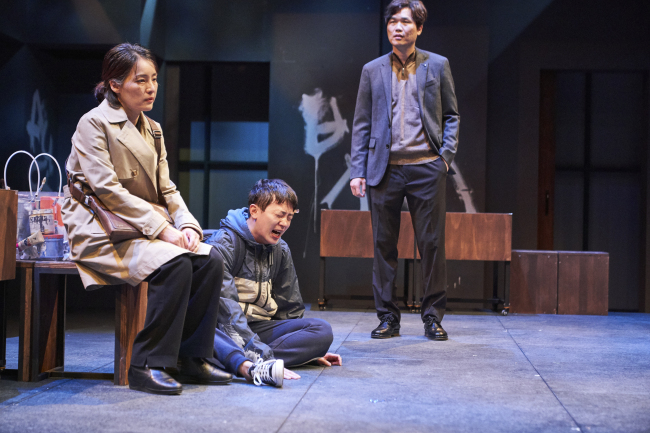 The drama follows Bong as she tries to track Lee down and bring him back to school. A firm believer in middle-class values and dreams, Bong thinks students must go to college and find decent jobs. On her quest to find Lee, she comes to understand the hurdles and stereotypes that her student faced at school. When Bong and an art teacher visit Lee’s apartment and meet his alcoholic father, Bong finds that staying with the family is not an option for Lee. The father, who does not care to look for his missing son, says the boy will eventually return and asks the teachers to join him in a prayer. A box of Lee’s drawings sits in the doorway along with an easel that has been broken into pieces and dumped there by the boy’s father. By the time she finds Lee, Bong cannot do much -- a gut feeling tells her that bringing him back home would not change his future much. Lee bursts into tears, confessing that he does not want to go back. The teacher, who wanted to put Lee back on the so-called “right track,” is no longer so sure what Lee should do. At the end of the drama, Bong appears to accept that the normal life trajectory of the older generation is not necessarily that of the younger generation. All she can do is visit the Chinese restaurant where her student now works and wish him the best, without truly knowing what is best for him. The only consolation is that the kid is happy where he is now, and no one is forcing him to pursue someone else’s dream. 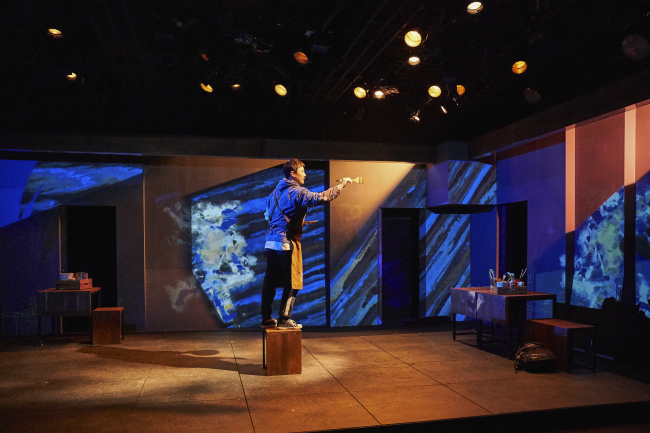 “Tracking Down the Steel Container,” part of “Apartment Nation” at Doosan Art Center’s Doosan Humanities Theater 2019, runs through May 5.